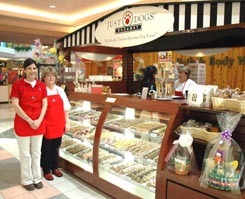 If you are looking for information on the Just Dogs Gourmet Dog Treats franchise business opportunity, Just Dogs franchises or Just Dogs dog treats franchising, then you have come to the right place. The vision of our business began five years ago when Colleen brought home Lucy, her new Golden Retriever puppy. Colleen had read that treats were an effective way to train a puppy so she went to her local grocer to purchase some. To her dismay the shelves were filled with treats that contained preservatives and ingredients she could not even pronounce. Colleen takes pride in the fact that she raised her children on nutritious homemade meals and believed Lucy deserved the same. She worked hard to make from scratch all-natural nutritious treats for Lucy and over several months developed treats that Lucy truly loved. Requests came from friends and family for these flavorful treats became to much for Colleen to produce in her small kitchen. She called her daughter who had her own grooming business in the Pocono Mountains and proposed that they open a business together. They agreed to open their very own gourmet bakery and grooming shop together located on historic Quail Acres. Since then a lot has happened. The store has expanded to include a general store, grooming salon and playground/exercise course. It has become a destination for dog owners in Western Pennsylvania. Just Dogs! GourmetTM has pulled together an outstanding leadership team to take Just Dogs! GourmetTM to a national household favorite and lead our industry in the retail of gourmet dog treats. Just Dogs! Gourmet™ offers some of the best training in our industry. About ninety-five percent (95%) of entrepreneurial businesses that start today fail in 5 or less years, but franchisee are just the opposite with more than 95% of franchisees still in business after 5 years! The proven business-format, branding and training offered in franchising is the secret. This training is for two days at our national training facility in Birmingham, Alabama where you will be instructed on the fundamental of the Just Dogs! Gourmet™ business as well as general business success skills. This training is conducted at our Home Office and Bakery in Washington, Pennsylvania. You and your decorator must spend at least 3 days learning to master the skills that have made our treats the very best looking treats in the industry. Our qualified field staff will be there during store construction, set-up and at least 3 days of your Grand Opening to make sure your staff is fully trained to do it the Just Dogs! Gourmet™ way. We will offer training at various sites for 1 to 2 days where you and your staff can come for a refresher training and obtain the latest product knowledge. All you pay for is the costs of travel and meals, there is no charge for this training. This web-based administration system offers streaming video instruction and various other resources to help you operate your business. You are able to order products, track Frequent Barker ClubTM members, communicate with the home office staff, track store statistics and more. This training is available from our technology consultants at Home Office Training, Grand Opening and on a scheduled basis through the web to maximize your team's knowledge of this important business tool. This system is custom configured for your store and provides a wide variety of reports essential to the overall management of your business. One of the greatest mistakes often made by new business owners is to not keep track of inventory and expenses, this system will help you master the skill of inventory cost control.